The industry leading delivery service provided by FedEx includes the ability to track shipments during almost every stage of the shipping process. Whether a shipment is in the air, on a cargo ship or in a local delivery vehicle, senders and receivers can find out the status and the location of their goods at any time during transit. A range of online, user-friendly tools and resources make parcel tracking with FedEx a simple process. Everything needed to check on the status of deliveries is available on the Tracking USA website. With no hidden costs and a range of tracking options, Tracking USA is free and very easy to use. As the popularity of online shopping continues to soar, the need for fast and reliable shipping services continues to grow. The ability to locate a parcel, and check on its delivery status, can put minds at ease. From warehouse to final destination, Tracking USA gives you the peace of mind that comes from knowing that your goods are on their way. Tracking your shipment with Tracking USA couldn’t be easier. From the drop-down menu on the home page, select the company that is responsible for delivering your shipment. Enter your tracking number in the appropriate box, and then click the ‘Track now’ link. That’s it. The Tracking USA system will provide you with status and location details of your shipment. This user-friendly service is available on mobiles and tablet computers too, so checking the status of your delivery can be done anywhere — at any time. Founded in 1971, FedEx was the result of an initial concept developed by Fred Smith. He wanted to start a delivery service that was capable of transporting a single parcel without using third-party services. Smith wanted to operate a single-carrier delivery service that operated its own hubs, aircraft, depots, posting stations and local delivery services. He called his company Federal Express – and the rest is history. After a period of rapid growth, Smith moved his company from Little Rock in Arkansas to Memphis, Tennessee in 1973. At first, Federal Express was offering overnight and two-day services between 25 major U.S. cities. And by 1976, the company was delivering more than 19,000 shipments a day. By 1977, Federal Express was operating its first aircraft, and it was listed on the New York Stock Exchange a year later. The company was a true innovator, which helped to speed up its incredible rate of growth during the early 1980s. Federal Express was the world’s first delivery company to use a centralized computer system to manage its entire delivery network. After changing its name to FedEx in 1994, the company started to expand its operations throughout Europe and Asia. Hubs were opened in France, Japan, Germany and Canada, and a series of acquisitions opened up new domestic markets in the UK and the Caribbean region. 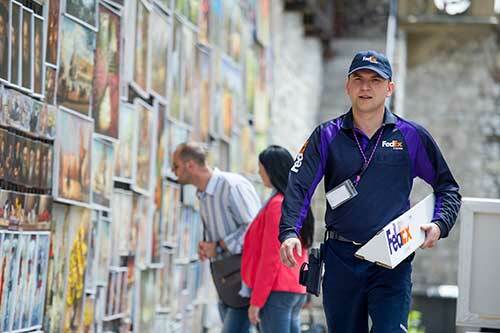 There are more than 1,700 FedEx offices around the world and around 700 FedEx World Service Centres are strategically located in several major countries. 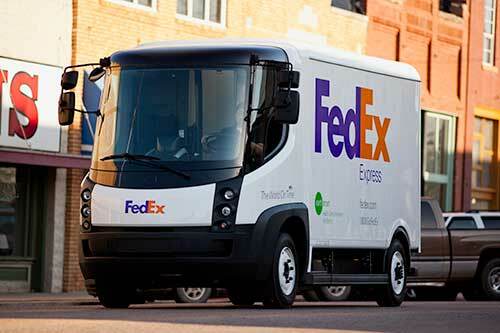 Operating 480,000 delivery vehicles and 12 air hubs, FedEx can deliver shipments to almost every village, town and city in the world. One of the things that makes FedEx unique in the delivery market is the FedEx Express division, which is an air cargo service that provides overnight delivery services to any location in the continental United States. The FedEx airline operates more than 600 aircraft and 30,000 delivery trucks, and it provides a world-class delivery service to more than 375 different locations around the world. 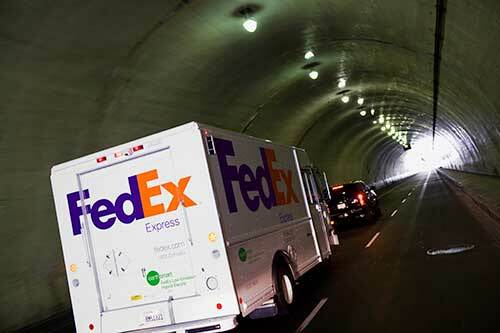 The FedEx Ground division guarantees delivery to every address in the USA and Canada within a definite time slot. Using only ground-based vehicles, FedEx Ground works with independent contractors and owner-operator drivers to provide a reliable delivery service at an affordable price. FedEx also operates a ‘less-than-truckload’ delivery service called FedEx Freight, which is the second largest provider of this type in the world. FedEx Office is the company’s retail division, which operates hundreds of stores throughout America. 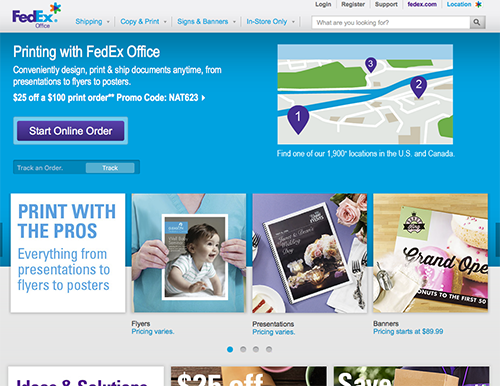 As well as offering a range of delivery services, FedEx Office provides professional printing services and computer rentals. Internet, fax and photocopying services give professionals the opportunity to access short-term office facilities without the need to rent space. Among the other divisions of this huge company are FedEx Smart Post, FedEx Trade Networks and logistics specialist FedEx Supply Chain Services. Everything needed to send and track shipments with FedEx is available from an FedEx Office online shop. A short registration process and some credit card details are all that is required to open an account. From their account page, individuals and businesses can obtain delivery quotes, estimated delivery times and various delivery options. Deliveries and pick-ups can be booked very easily, and a range of different services help frequent users to speed up their delivery process. But there is no need to register or log in to an account to send single packages that weigh less than 68 kilos. Users who have registered and signed in can order delivery materials, ship heavy items and arrangement for the delivery of multiple items in a single shipment. The most famous and iconic branch of this international brand is FedEx Express. Featured in TV shows and major Hollywood movies, the airfreight division of FedEx guarantees delivery to any address within the continental United States in one to three days. FedEx Express is so popular in America and throughout the world because of its door-to-door, customs-cleared service that makes shipping hassle-free. 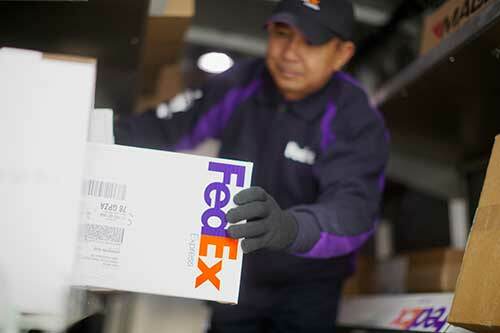 FedEx Express delivers more freight by air than any other airline in the world. With the second largest fleet of aircraft in the world, this huge delivery service is based at Memphis International Airport, but it has significant hubs in Paris, Cologne and Miami. FedEx Express currently offers a wide range of services for customers all over the planet, including overweight shipments, international shipments and documentation services — which include legal and taxation compliance. The FedEx mobile app is currently available for Apple devices, Android devices and Blackberry phones. This user-friendly app provides mobile users with tracking information and status updates. 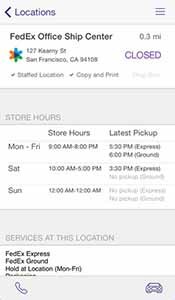 It is also possible to obtain delivery quotes and estimated delivery times using the app. Shipping items and arranging drop-offs is a simple process involving the entry of some basic information and credit card details. Not only is FedEx a huge international company, it is regarded as one of the best employers to work for in the world. The company was named as one of the ‘100 Best Places to Work for’ in 2014 by Fortune Magazine, which is why jobs at FedEx are so coveted. The company also has the honor of being the eighth most reputable company in the U.S., according to the 2014 Reputation Institute rankings. FedEx currently employs more than 300,000 people all over the world, and there are always vacancies at every level of the organization. Among the many different positions available within FedEx include couriers, administrators, warehouse operative, logistics specialists, sales professionals, driver and engineers. There are also job opportunities within customer service departments, sales departments and finance departments. Other areas of operation that are always searching for the right people to join the FedEx family include operations management, IT and human resources.